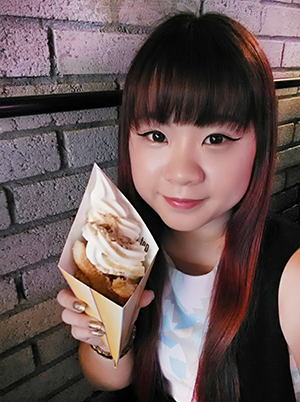 My first fashion event as a blogger! 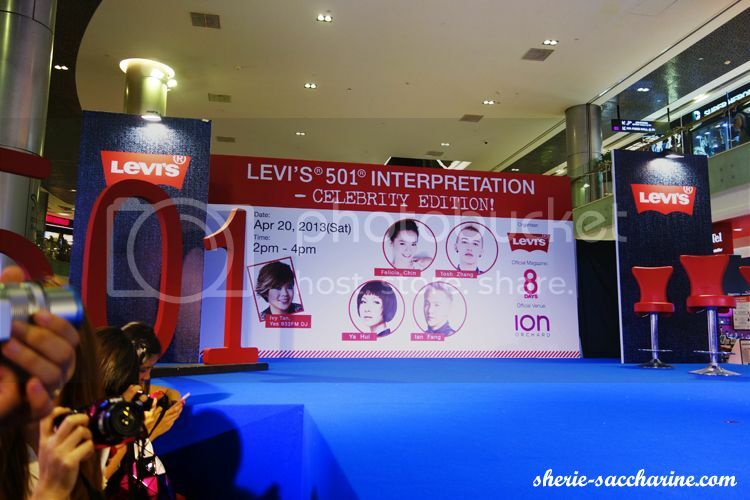 I was invited by omy.sg for the exciting Levi’s® 501 Interpretation Event at ION Orchard on 20 April, and I really enjoyed my 2 hours of celebrity gazing in front of the stage! 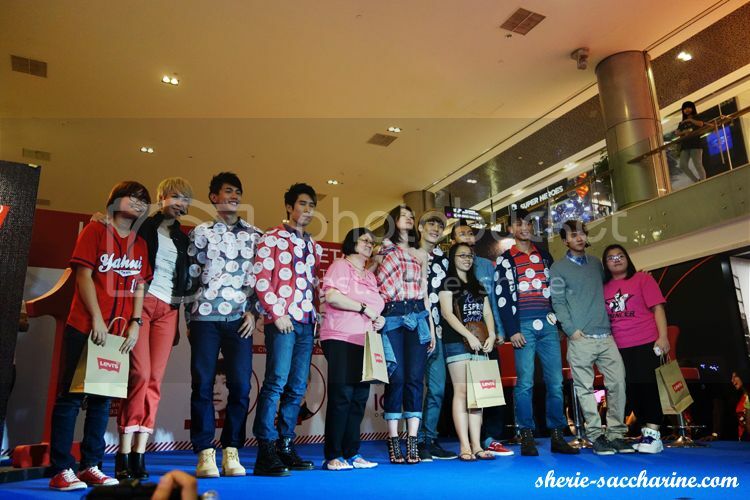 After waited for a while, the bloggers finally got the chance to queue for a photo session with the stars of the day. 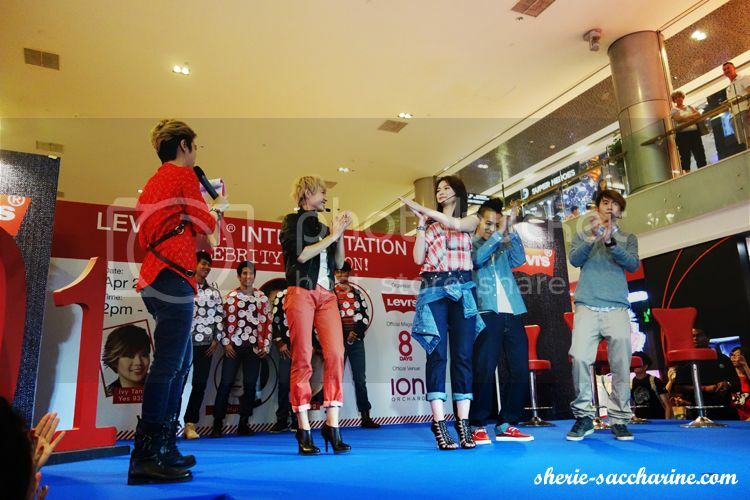 Look, Tosh is looking at me! 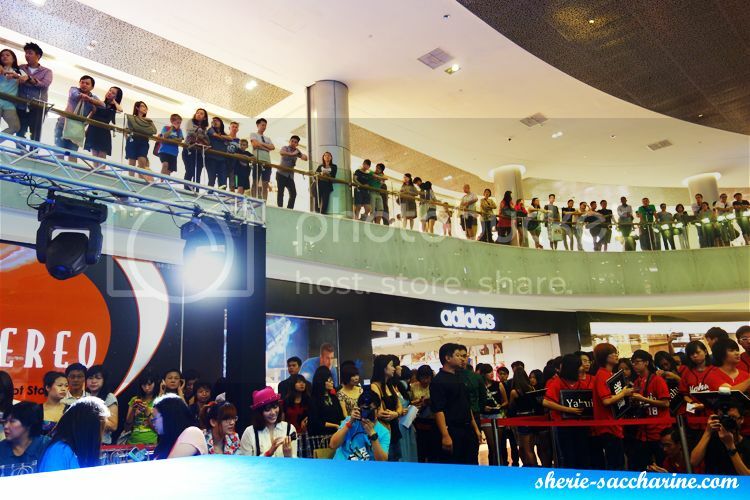 There was a huge crowd gathered at B3 and B4 to wait for their favourite celebrities! 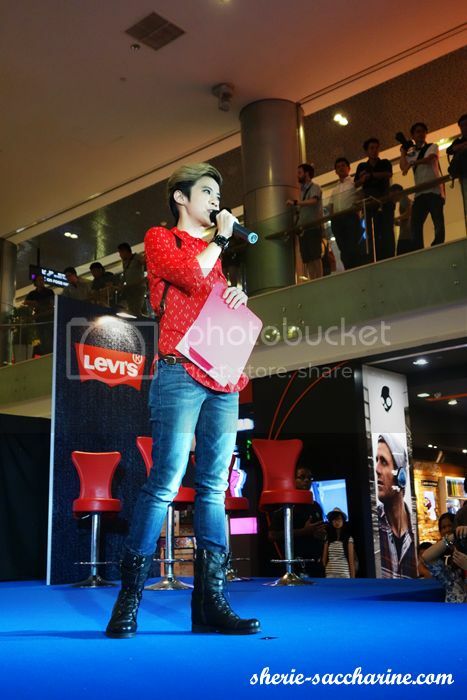 At around 2pm, DJ Ivy Tan addresses the audience, fully cladded in stylish Levi's apparels! Yahui and Tosh walked the runway in style! Do you know? This Spring/Summer 2013, the Levi’s® brand is marking the 140th anniversary of its iconic 501® jeans by introducing a non-denim Levi’s® 501® collection for the first time. Breaking with tradition, yet maintaining the product’s true essence and timeless spirit, the three-piece non-denim collection is available in true chino, chalk blue and mineral red. 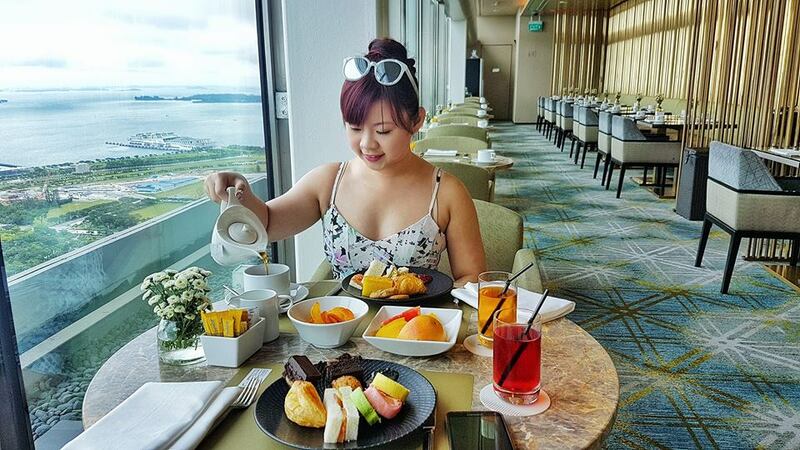 Ya hui is spotting in the feminine mineral red! 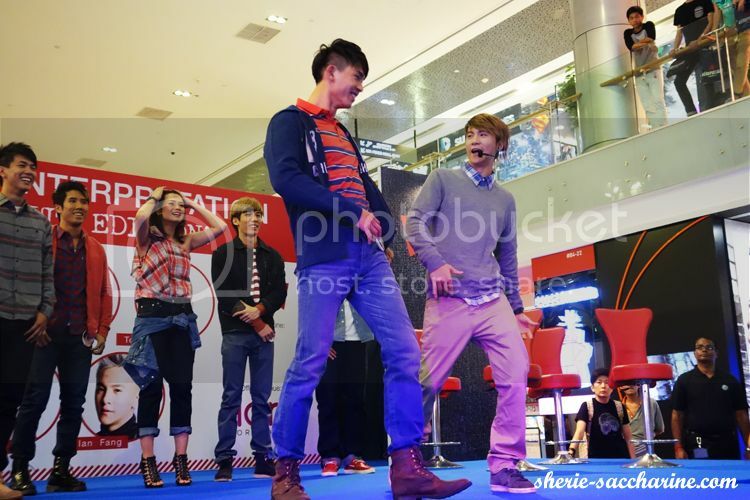 Tosh is such a heart-throb, he show off some dance moves that leave girls (and some guys) in awe! 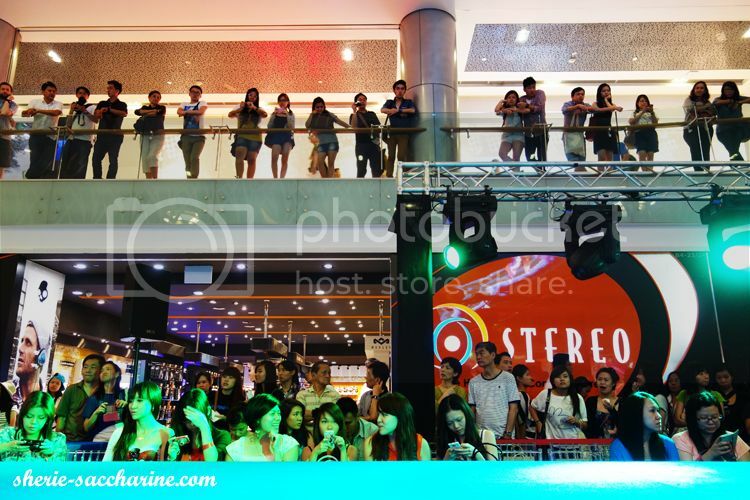 The first stage activity with the audiences. 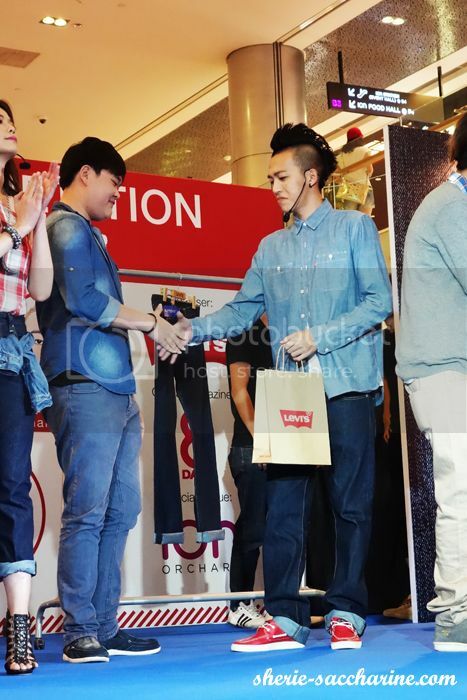 The celebrities are required to work hand in hand with their team mates to label all signature icons of a Levi's 501 e.g. Button Fly, Dual Horse label etc. Felicia came in first! Look at her elated face. But there's no losers as everyone else got themselves a Levi's goodie bag. The next stage activity is for the celebrities to unleash their creativity and fashion sense by dressing up 8 Days shirtless guys! Whoohoo, muscle men! 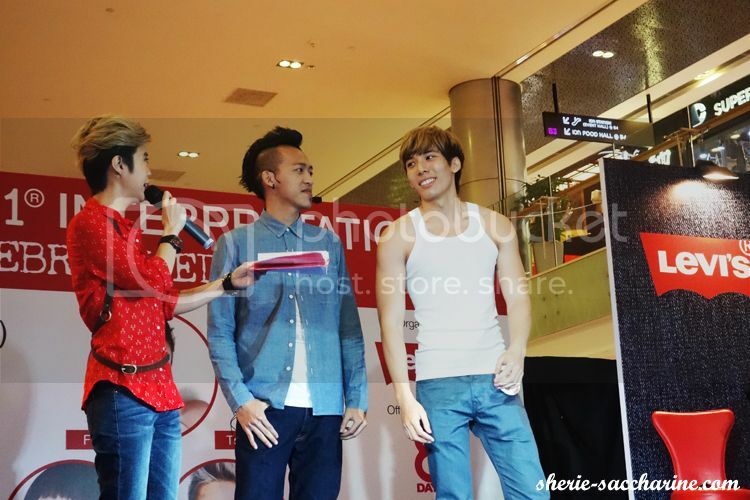 Yahui is so lucky to get the chance to style the cutest shirtless guy (who happens to be my sec sch junior)! 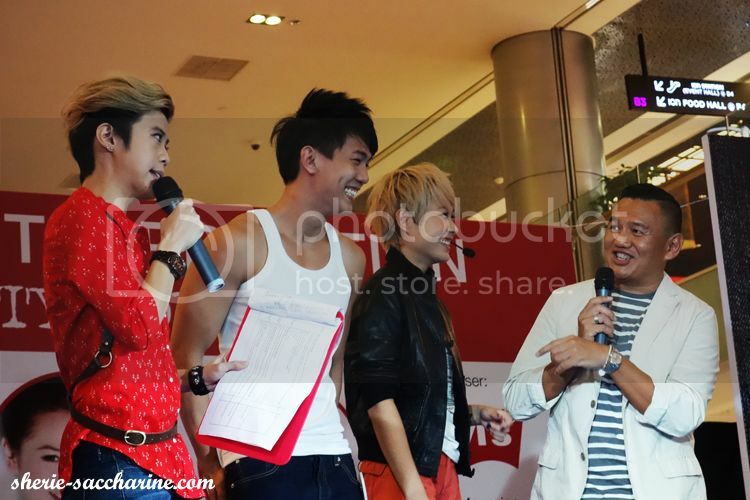 Look at them, smiling from ear to ear. Ian crying for some justice as the guy is too cute to resist for the voters! 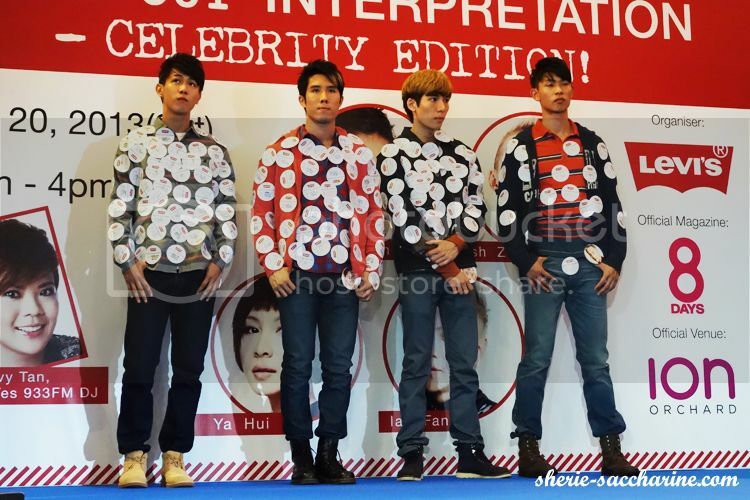 The shirtless guy were asked to do some push-ups and catwalk with the outfits to show its comfort and style! Proud stylists and their models of the day. 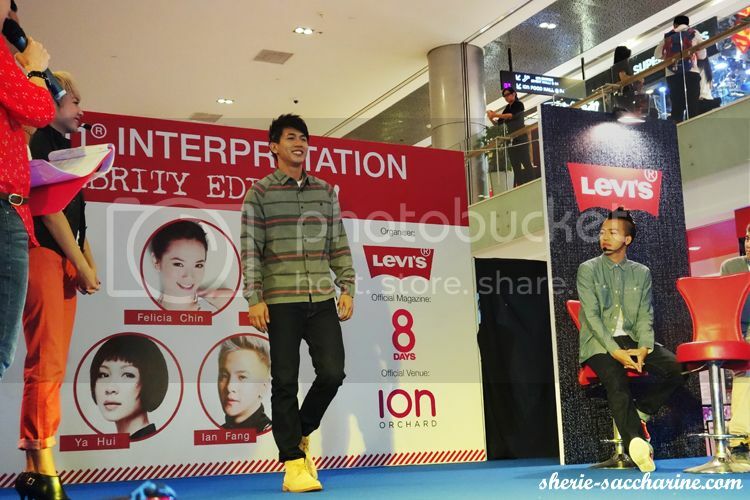 Tosh's model is like the young Elvin Ng, and very Korean look-alike. The swaggers hit the runway with an attitude. The guys received overwhelming votes from the excited fans and of course, I cast my vote to my favourite Tosh! The winning team is.... Yahui and Nick! The cutest team with the most sunshine smiles! Group photos with the winning voters as well! 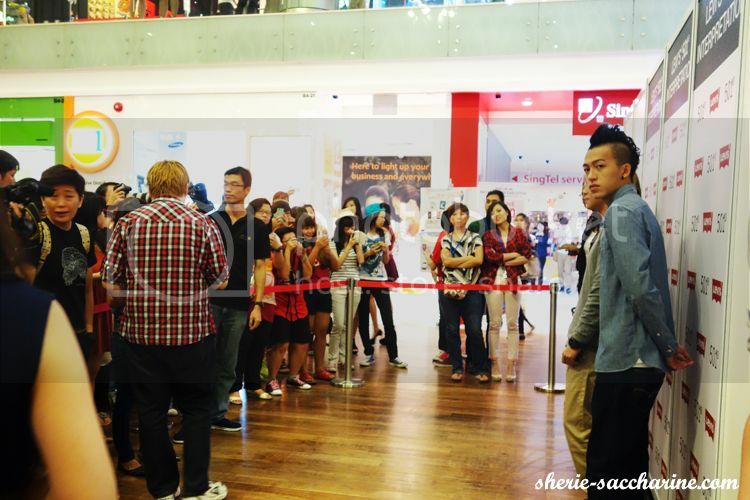 It's definitely an event filled with the most number of hunks and babes gathered at one place! Of course, a successful event have to be backed by a great team! Thanks team Levi's! 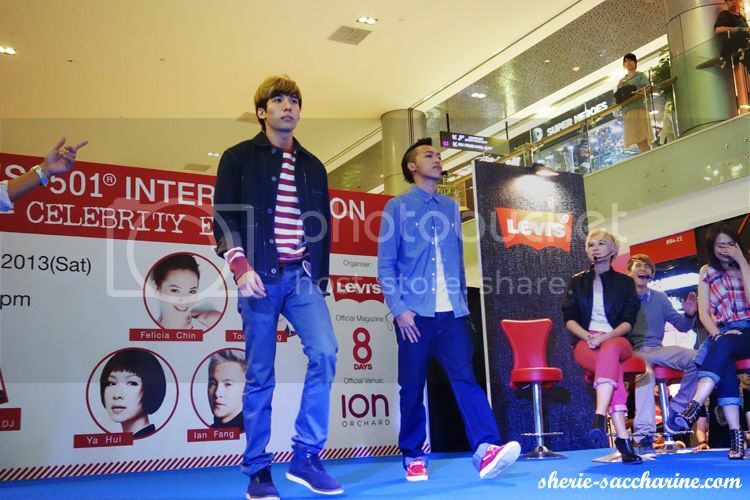 Wanna be a style icon with Levi's apparels? 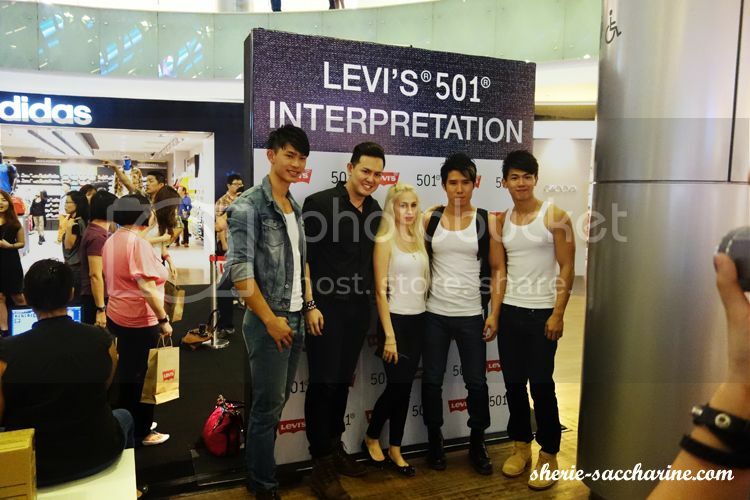 JOIN LEVI'S® 501 INTERPRETATION CONTEST! 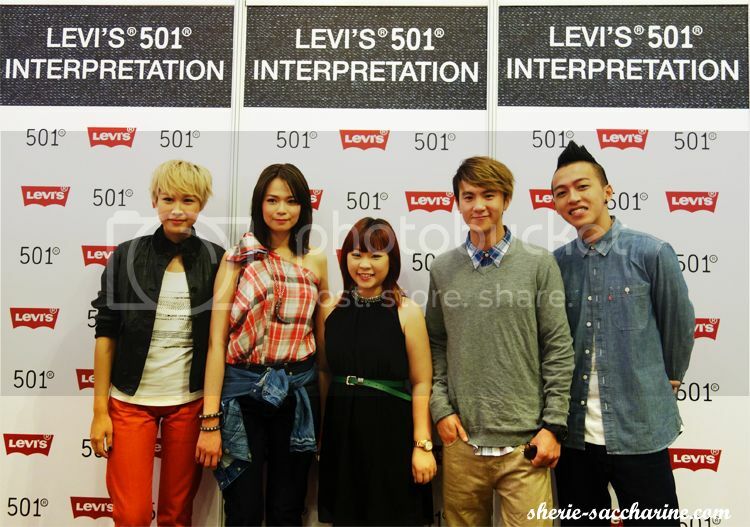 Share your 501® look which best represents your individual 501® style interpretation and be part of Levi's® 501 gallery!